This game feels like it was made in the 1990’s… and I love that. As a JRPG fan who grew up in the 90’s, Square Enix’s SNES and PS1 era JRPGs were a huge part of my childhood. Final Fantasy VI and Final Fantasy IX are two of my favorite games of all time. Suffice to say, I’m a sucker for games that cater towards this nostalgia.With that being said, my experience with “I am Setsuna” so far is everything I could have wanted or expected from a game like this. “I am Setsuna” is by no means the best game of 2016, but if you go in expecting to experience what it’s like to play your favorite 90’s JRPG for the first time again, you’re in for a treat. My words would not do the music any justice, just listen. The music in this game, consisting mostly of solo piano pieces, is haunting, full of emotion, and absolutely carries the game. The soundtrack has an amplification effect on all aspects of the game. The characters, settings, story events, even the gameplay all feel more “full” due to tracks that perfectly set the tone throughout the game. While the gameplay isn’t exactly deep or challenging so far, it is still very satisfying. The battle system is very similar to that of Chrono Trigger, while the equipment/skill system is similar to Final Fantasy VII. Skills aren’t acquired through levels, they are acquired by combining loot obtained from monsters. The way the drop/loot system works is genius and something that I wish more JRPGs would try to emulate. There are no random drops from enemies, instead, enemies drop items when you satisfy certain conditions with the way you defeat them. If you satisfy multiple conditions, you will get all of the items for the conditions that you satisfied. For example, if you defeat an enemy with a powered up lightning based attack, then you will get two drops from the enemy: one for defeating them with a powered up attack and one for defeating them with a lightning based attack. Random drops are extremely frustrating; This system feels like a breath of fresh air for the JRPG genre. The game oozes “small budget production” in almost every aspect of the game, but this is a good thing. The budget (or lack thereof) forced various design decisions throughout the game. The developers didn’t have the budget for an overwhelmingly amount of side quests to distract you from the surprisingly personal story of sadness and suffering that this game tells. The developers didn’t have the budget to populate the world with hundreds of NPCs in tens of towns, so they created a small world with personality. I appreciate the fact that I won’t have to invest large amount of time to experience all that this game has to offer. There’s not much that I don’t like about the game. 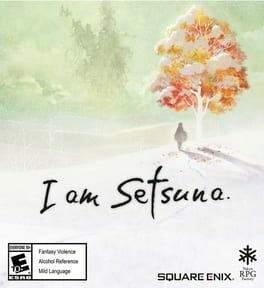 I’m very satisfied with every aspect of “I am Setsuna” at its core. However, the game is not perfect and there are a few things that I think could have improved the game. I consider the below points nitpicks about an otherwise great game. All of the environments I’ve reached in the game so far can be described as “snowy, wooded, wasteland”, and I don’t see this changing much for the rest of the game. While I do like the general graphics and art style and how the setting matches the tone of the story, I can only handle so much snow. I think the town and dungeon design is fine; I enjoy exploring all of the environments in the game (mainly because that means I get more time to listen to the soundtrack). However, instead of thinking “Nice, a new dungeon/town! Can’t wait to explore it!”, I find myself thinking “oh… another icy/snowy town/dungeon…”. This complaint arises from my complaint about the setting. The main menu which is used to manage items, skills, equipment, party, etc. has a sort of “gray, arctic” theme. This is fine, looks great, and the UX of the menu is pretty good. However, because most of the game takes place in a snowy environment, the menu tends to blend into the surroundings. It can be hard to navigate the menu in certain areas of the game due to the colors blending in to the background. In battle, many attacks and skills are targeted at an enemy, but affect an area around the enemy. Unfortunately, the game doesn’t show you the range of the attack you are using. This means you will often be asking yourself, “I’m targeting enemy A, is enemy B close enough to be hit by this?” and you will often be wrong. If the game were actually difficult, this would be a huge problem, but as it is, this is just a minor annoyance.